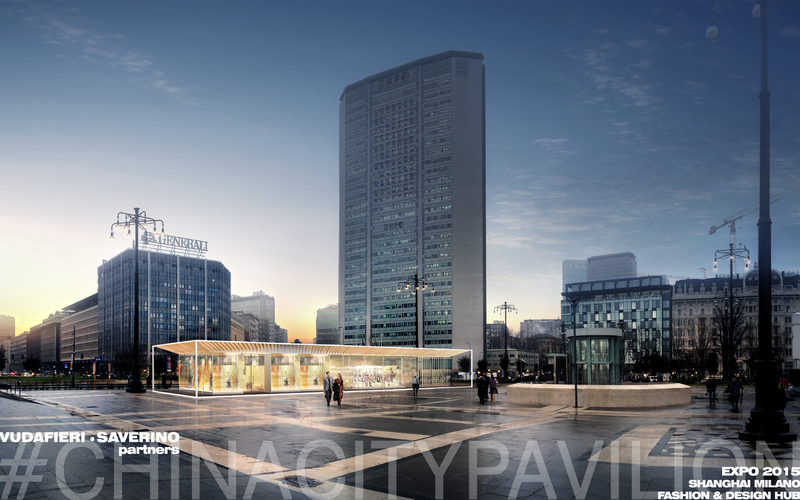 Situated in piazza Duca d’Aosta opposite to the central station, the City Pavilion is the only officially endorsed pavilion in the centre created to logistically support the three Chinese pavilions located at the Expo 2015 site. A strategic location both in terms of visibility and accessibility, the pavilion acts as a prestigious showcase, a meeting area and place of exchange for Chinese and Italian companies seeking opportunities in their respective markets. It also provides a point of encounter for business people hoping to foster international contacts in the heart of Milan. The dynamic geometry of a heron’s wing provides the rules of composition for this structure. Lightness, order and balance are the guiding principles. An open plan, a pure volume made of glass, an outdoor space inspired by the atrium of a Roman house underscored by a powerfully graphic portico. It all adds up to a summary of the very concept of ‘pavilion’. The pavilion is designed to be itinerant: dismountable, adaptable and easy to re-use. It embodies ideals of modernity and sustainability. The structure becomes a house shared by two cultures, a contemporary showcase for the best of China and Italy. The wide portico, with its pagoda-style roof in laminated plywood, protects and delineates the glass volume which contains three distinct zones: a showroom, an institutional living space and a food and beverage area with an external patio, adding up to a total surface area of 360 square metres.